Guatemala City – Holding picket signs emblazoned with messages condemning corruption, Dolores Yal and other indigenous Maya Kaqchikel women and men lined up behind their banners, waiting for the march to begin. 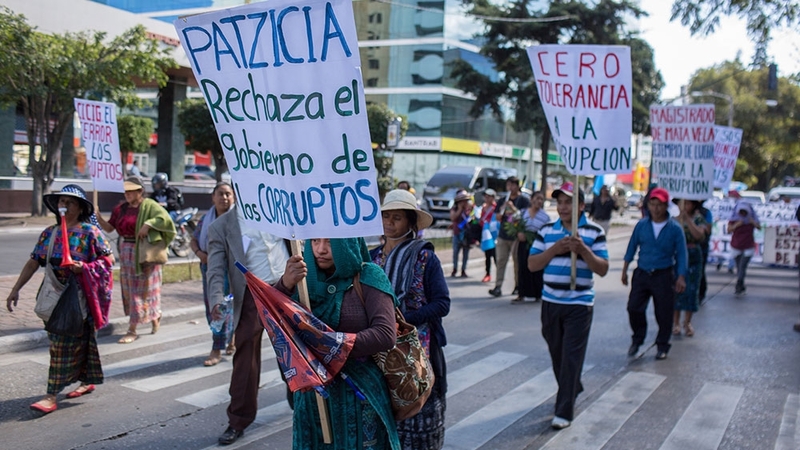 They travelled 65km from the Patzicia municipality to Guatemala City to join hundreds of Guatemalans to march against the latest government threats to constitutional order and anti-corruption efforts. “We are here to oppose corruption. We have already been battling it for years,” Yal, a leader of the Residents Against Corruption in Patzicia movement, told Al Jazeera. The protests come after Guatemalan President Jimmy Morales on Monday shutdown the International Commission Against Impunity in Guatemala (CICIG) and ordered its international staff to leave the country within 24 hours. The CICIG shutdown and government defiance of Constitutional Court rulings overturning its anti-CICIG measures have sparked widespread opposition. Patzicia residents, urban collectives, human rights activists, students, artists and other Guatemalans gathered at a capital city roundabout Saturday to begin an hours-long march into the downtown core. “We do not want [CICIG] to leave the country. We want it to come back,” said Yal. Jorge Santos sees the growing demonstrations as a positive sign. The executive director of Udefegua, a national human rights group, Santos attended the march along with other human rights observers from the organisation. “The executive branch of government undertook these illegal, unconstitutional and illegitimate actions during a period when they did not expect people to react, between Christmas and into the new year,” he told Al Jazeera as hundreds of people began marching up a boulevard. Established in 2007, CICIG gained international attention following an investigation into the administration of then President Otto Perez Molina, which led to his resignation in 2015 and prosecution for corruption. Morales was elected president on an anti-corruption platform just days after Perez Molina’s arrest. Since taking office in 2016, however, the Morales administration has faced investigations into alleged acts of corruption, including illegal financing of the 2015 campaign. Morales has denied all allegations of corruption. As the investigations into Morales and his party progressed, the administration attempted in 2017 to derail CICIG’s investigations by declaring head commissioner Ivan Velasquez persona non-grata, attempting to bar him from the country. The measure was reversed days later by the country’s Constitutional Court. In August 2018, Morales announced that he was not going to renew CICIG’s mandate and then barred Velasquez from the country in early September. Once again the Constitutional Court ruled against Morales’s unilateral decision, but the administration refused to comply with the court order. The battle between the government and the country’s top court continued over visas for international CICIG personnel in December 2018 and into the new year, when the government detained a CICIG investigator January 5 for more than 24 hours upon entry at the airport. Two days later, Morales announced Monday that the government was unilaterally withdrawing from the agreement with the UN that established the CICIG. He accused the body of polarising the country, violating human rights, and being allied with criminal structures and “terrorists”. “The [government] thinks that it has absolute power,” said Pamela Saravia, a member of the Batucada del Pueblo collective that has participated with drumming in nearly every anti-corruption protest since 2015. “This is the moment to tell them that it isn’t that way. We need to defend the constitution,” Saravia told Al Jazeera. The Constitutional Court ordered a provisional injunction on Wednesday, reversing the expulsion of CICIG, but the highest court itself is also under attack. The government has been defying its rulings, breaking with constitutional order, and government-aligned politicians are attempting to remove judges. In a public statement on Friday, the Guatemalan government pledged ongoing support for anti-corruption efforts and the rule of law, but made no explicit mention of either CICIG or the court. Velasquez weighed in on Friday with an 11-page letter to UN General Secretary Antonio Guterres, laying out details of the commission’s work and responding to the accusations against CICIG levelled by Morales, among others. “The smear campaigns, defamation and threats have increased. That is expected when it comes to a body that has as its goal the prosecution of structures that co-opt the State to make a profit and that refuse to give up the privileges they obtained illegally and illegitimately,” Velasquez wrote. Saturday’s march kicked off several days of protests and scheduled for next week around the country. A broad coalition of organisations has organised highway and border blockades on Monday, and a rural social movement has plans for further nationwide actions on Tuesday. Guatemalan movements see the struggle against corruption and a constitutional breakdown as more important than ever as the country prepares for the June 2019 general elections. “The issue right now is that we must defend and guarantee that the government respects the constitution,” said Saravia. “We must prevent by all means the authoritarianism of the government that we are seeing today,” she said.